Fans of marble-bashing games have plenty of options on the iPhone and iPod touch, but for my money, you can’t go wrong with Luxor and its ancient Egyptian spin on things. Since Luxor’s initial smash on the App Store, developer MumboJumbo has rolled out iPad versions of the game—Luxor HD late last year and Luxor: Amun Rising HD just last month. The iPad iterations faithfully recreate the gameplay experience of the iPhone game—and that’s a good thing. If you’re not familiar with Luxor, it features a scarab beetle pushing a line of marbles down a winding path toward a pyramid. Your mission: destroy that caravan before it reaches its goal by firing colored marbles to make a chain of three or more similarly colored orbs. Creating such a chain makes the targeted marbles disappear—and earns you bonuses and power-ups you can use to further clear the path of those venomous scarabs. 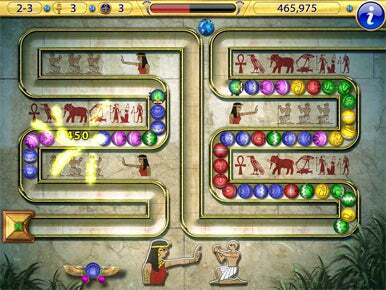 As you progress, the paths get more complex and the marbles more plentiful, ramping up Luxor’s challenge. Rolling Down the Nile: Both Luxor HD and Luxor: Amun Rising HD (shown here) deliver the same kind of gameplay as the original iPhone version of Luxor, only on a much bigger canvas. The original iOS version of Luxor made great use of the iOS’s touch controls. You would move your shooter back and forth with a sideways swipe; tapping the screen fired a marble. If I had one complaint about Luxor on the iPhone, though, it would be the limitations of that device’s screen. Accurately lining up a shot can be a bit of a challenge on the iPhone and iPod touch, leading to the occasional misfire. That’s not an issue on the iPad’s ample screen, which Luxor HD and Amun Rising HD both exploit to perfection. (Despite the different names, gameplay is the same on both iPad apps. They just offer different stages—88 levels on each game, according to MumboJumbo.) It’s easy to move the shooter back and forth, change the color of your marble ammo with an upward swipe, and fire off a shot. Now when I misfire, I can only blame my lack of skill and not the limitations of the screen. The ancient Egypt-inspired graphics, clever sound effects, and stirring music from the iPhone version make their way into Luxor’s iPad efforts. I particularly like how the music becomes more epic and menacing as the marbles get too close to the pyramid for comfort, and the clang of marbles when you misfire a shot is truly heartbreaking. If you’d prefer to listen to your own tunes while blasting marbles to kingdom come, Luxor HD and Amun Rising HD will accomodate you—you will want to adjust the volume of the game’s music and sound effects, though, which is easy enough to do. Some iOS gamers balk at having to buy multiple versions of the same game for each of their mobile devices. That’s not the case here—Luxor and Amun Rising may carry the “HD” moniker, but they’re universal games that run on the iPhone and iPod touch as well as the iPad. In fact, iPhone 4 and fourth-generation touch owners will enjoy graphics enhanced for those devices’ Retina displays. iPhone 3GS owners like myself can take comfort in the fact that either games runs perfectly well on our phones. Both Luxor games feature two modes of gameplay—an adventure mode where you compete in a series of increasingly difficult levels and a continuous play mode where you keep battling marble-pushing beetles in unlocked stages until you’re overtaken by marble madness. The varied gameplay keeps things fresh, and the fact that you can stop and start Luxor at will—the game will save your progress—makes it an ideal casual game when you need to take a break. Both Luxor HD and Luxor: Amun Rising HD will appeal to fans of the original game, while probably earning new converts to the franchise. And with both games marked down by 90 percent as I write this review, there’s never been a better time to download either game.